Whether you are self-conscious because you have yellowed teeth from smoking or drinking coffee, or if you just want to look your best, tooth whitening is a sure way to brighten your smile and gain increased confidence in your appearance. This is a wonderful teeth whitening technique that allows us to easily, comfortably and safely whiten your smile. In our La Mesa office near El Cajon, we use a special, mild, pleasant tasting carbamide peroxide gel that, over a period of 7-10 days, can dramatically whiten your smile. Custom-made, soft plastic stints are fabricated that allow you to wear them almost invisibly. The special tooth whitening gel is placed in these stints and worn for several hours a day (or night). Most patients notice a difference in just 6-8 hours of time. Almost all of our San Diego area patients have completed their tooth whitening within 2-3 weeks. Darker teeth may take longer. The most effective teeth whitening techniques available today are in-office laser tooth whitening and at-home teeth whitening with custom-fit trays. Both teeth whitening techniques are best performed under your dentist’s supervision at our La Mesa dentist office to ensure the safest results. 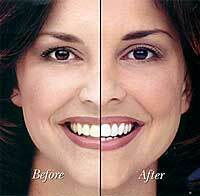 Zoom in-office teeth whitening methods are performed with the Zoom teeth bleaching gel and laser light. Zoom whitening is a good method of teeth whitening for sensitive teeth, as the process may be closely monitored by La Mesa cosmetic dentist Dr. Jeff Gray. The teeth are carefully isolated from the lips and gums, and then the Zoom teeth bleaching gel is applied to them. A laser is used in conjunction with the Zoom gel to accelerate and amplify the tooth whitening process. There are several choices for those who are interested in at-home teeth whitening methods. Dr. Gray can take imprints of your teeth and then make custom-fitted trays for you to take home to complete the tooth whitening process. There are also teeth bleaching kits and other over-the-counter teeth whitening products available to brighten your smile. The cost of teeth whitening varies according to the type of teeth whitening method – whether professional in-office or at-home. Find out how you can whiten your teeth for Smiles 4 Life. To date, Crown Council Dentists across the county have raised over $22 million dollars to help give the children with cancer, and their parents, a lifetime of smiles they might have missed. More full face images are available at our conveniently located office in La Mesa in the San Diego California area. Feel free to stop in anytime to view many more full face photos at no obligation. You can also call us at 619-717-8560.